An accurate identification of anatomical cardiac features allows more robust and accurate functional and structural analysis of the heart. 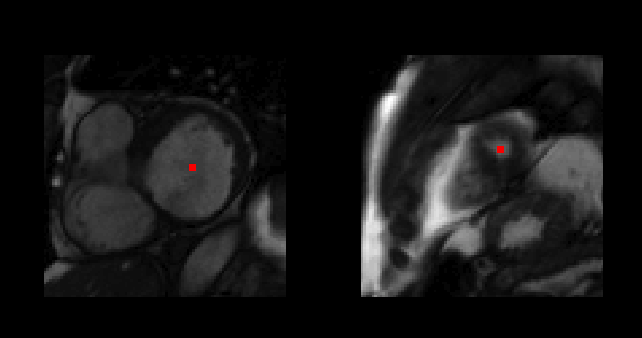 Hence, anatomical landmark points are obviously essential for an automated cardiac MRI segmentation method. In this challenge, we focus on automatic landmark point detection method, which is particularly necessary for building a 3D LV model. These landmark points include mitral valve points, right ventricular (RV) insert points and base-to-apex central axis points. Mitral valve separates the left atrium (LA) and the left ventricle (LV). When the mitral valve opens, oxygenated blood flows from LA to LV. The mitral valve closes during systole (contraction), which forces the blood to exit to the aorta via the aortic valve. 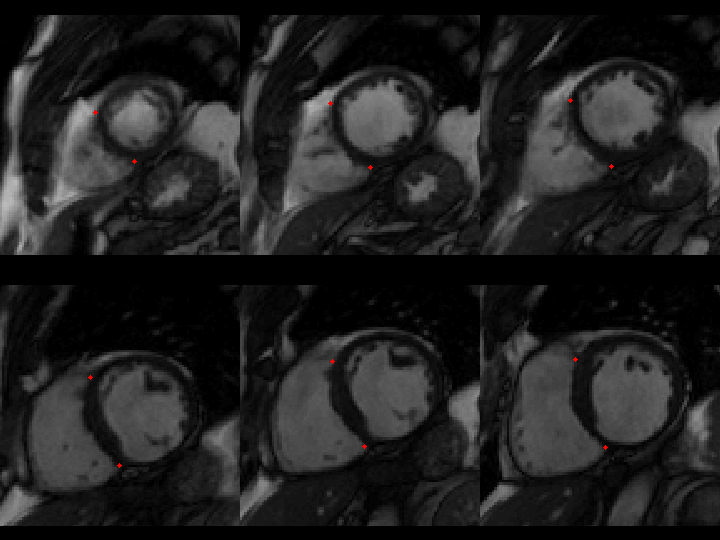 In MRI, the mitral valve is clearly shown in long axis view, because this view shows both LA and LV. Two end points of the mitral valve define the mitral valve points. A line connecting the mitral valve points is usually referred as the base plane, which defines the border of LV at base. The base plane is crucial because it affects the LV volume measurement. During cardiac cycle, the position of mitral valve points oscillates following the base plane longitudinal shifting due to breathing. Your task is to detect the mitral valve points only at end-diastolic (ED) frame from long axis view images. The movie above shows a tracking of the mitral valve points from ED, but this tracking process was performed with an automated method, and thus cannot be considered as the ground truth. Two intersections between LV and right ventricle (RV) in short-axis view images define the septum. These intersections are usually marked as RV insert points (see figure above). The RV insert points are also important for 3D cardiac modeling, particularly for biventricular models. These points are also used as important landmarks to determine regional myocardial segments, as defined by the American Heart Association (AHA). In this challenge, we ask participants to define RV insert points only at one particular frame (usually at End-Diastole) on multiple short-axis image slice images. DICOM image filenames of these specific frame and slices of short-axis MRI are pre-defined in the annotation files. Base and apex central axis points are not actual anatomical landmarks, but they are essential to define the LV central axis for 3D LV models, as well as for the AHA regional segments. For each patient study, one central point at a basal slice and one central point at apical slice are needed. Both are defined at the middle of the LV cavity on short-axis MRI. Similar to RV insert points, we pre-defined the two DICOM image files for the basal and apical slices.